Sometime in ’07 I had vowed to purge all things sweet: chocolate, ice cream, lollipops, tres leches cake and some other edibles that will remain unnamed! Y-E-A-H-R-I-G-H-T! Some weird vein in me thought that I was conscious enough to extend the extinction of coffee in my daily fixes into dulces (if you read the post on espresso flan, you’ll understand this). Us Latins know no bar when it comes to sweets. A Brazilian girlfriend and I were just talking about how our diet is not conducive to owning a flat in plastic city (ies). Those chics’ hair on their arms must raise in panic at the thought of sugar! Not ME! I could write a book on Latin desserts alone! Don’t you start to think the name Flanboyant represents my singular desire of sharing of all things flan. You will be fed others….dulce de leche, or pudin de pan…hmm…smack yo’ momma kind-a-good! On Thursday, I was unjustifiably bored, (never possible), definitely hungry and for certain not driving to the grocery store. It was snowing fast and furious in HOTlanta and my dag on gear shift in my Volvo was not coming out of park!! (quick call to my mechanic fixed that problem). Being somewhat stranded, I decided to get inventive–and it worked! I came up with cooked pineapple and conjured up a super good and kind of gooey spiked crema to pour over it. Now… if you’re not a drinker, like myself, you WILL be okay. Trust me. What I’m about to show you is pretty, sweet, easy, fast, semi-healthy (meets the daily fruit intake, in part) and uhm uhm good! No more than 6 minutes, tops–well if only for 2-3. 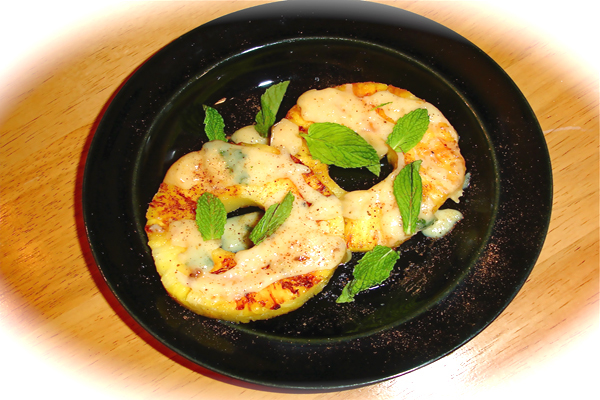 I like to call it Drunken Pineapple in Ginger Mint sauce! Yeah baby! If you thought you were done with sweets, oh well. If you’re using fresh pineapple, peel and cut into 1/4 in. slices or nice size chunks (cubes). I like sliced as pictured. Alternatively, you can buy ready to eat, sliced and fresh, pineapple. Drain pineapple completely. In large skillet, cook pineapple slices on each side for one minute or until light brown, on high heat. Grill on medium if using stovetop grill. Set aside on plate. In medium saucepan, mix milk, whipping cream, rum, ginger, salt and mint. On low-medium heat, cook mixture while stirring for 3 minutes or until milk is reduced about 1/2 thinner. Pour over pineapple! Sprinkle nutmeg overtop and garnish with mint leaves if you like. Living in Barbados. Even If For 5 Days.